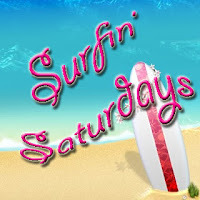 Hello and welcome to Surfin Saturdays!!! I love to find new blogs and gain new readers. I would love to follow you back so please leave me a comment and I will follow you too. Have a wonderful Saturday and stay warm and dry!! Have a Fabulous Weekend!! xoxo from The Adventures of Mommy B!! Hi Liz . . . thanks for following my blog . . . I'm following you back as well. Stopping by via the weekend hops to say hello and to follow. Have a great weekend! Stopping by/commenting back from your visit to my blog - Positive Kismet...Thank you! Hi! Coming over via the blog hop! It's very nice to meet you! Hey there! I came to follow you back but I already do follow! YAY! Im hoppin in from the weekend blog hops and wanted to stop to wish you a wonderful holiday season! Following you back from my Channeling Ricky blog. Thanks for the follow. You have a cute spot. I am going to spend some time looking around and I will drop back by in the future. Thanks for following. Im now following back. Have a Merry Christmas.